Polo Pony is a perfect mix of national and international Polo News wrapped around Polo Videos, Polo Photos, Polo Directory listings of the finest Polo Club, Polo Forum, Polo Classifieds, Polo Jobs and Polo Travel. Polo Pony is committed to providing the finest resources for Polo and High Goal Polo in America and Internationally. 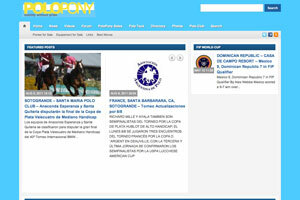 Polo Pony is a Polo News and everything Polo phenomenon.